One of the problems with a cheap drone is getting good video, especially in real time. Cheap hobby quadcopters often have a camera built-in or mounted in a fixed position. That’s great for fun shots, but it makes it hard to get just the right shot, especially as the drone tilts up and down, taking the camera with it. Pricey drones often have a gimbal mount to keep the camera stable, but you are still only looking in one direction. Some cheap drones now have a VR (virtual reality) mode to feed signal to a headset or a Google Cardboard-like VR setup. That’s hard to fly, though, because you can’t really look around without moving the drone to match. You can mount multiple cameras, but now you’ve added weight and power drain to your drone. MAGnet Systems wants to change all that with a lightweight spherical camera made to fit on a flying vehicle. The camera is under 2.5 inches square, weighs 62 grams, and draws less than 3 watts at 12 volts. It picks up a sphere that is 360 degrees around the drone’s front and back and 240 degrees centered directly under the drone. That allows a view of 30 degrees above the horizon as well as directly under the drone. There is apparently a different lens that can provide 280 degrees if you need that, although apparently that will add size and weight and be more suitable for use on the ground. The software (see video below) runs on Windows or Android (they’ve promised an iOS version) and there’s no additional image processing hardware needed. The camera can also drive common VR headsets. This is [Thomas Clauser’s] Google Street View enabled treadmill. He points out that most of the Street View hacks use a measurement of rotational movement to interface with a computer. He respects that but didn’t want to take the time to make it work with his treadmill. 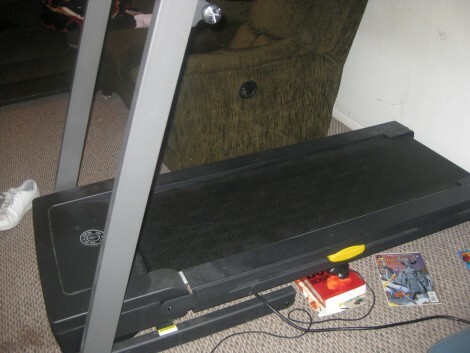 Instead, he used a stealth switch propped up on a book below the treadmill frame, but any switch can be used as long as you know how to connect it to the computer. When you stand on the treadmill the frame flexes and almost clicks the button, but when you start running it moves the rest of the ways and closes the switch. From there an autohotkey script is used to advance Street View. 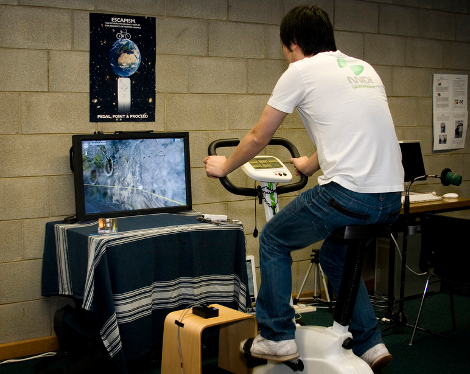 As part of a Master’s Thesis [Lette Moloney] made this exercise bike control Google Street View. The hardware setup is quite rudimentary, two hall effect sensors mounted next to each other detect a magnet that was hot-glued to the crank. When the magnet passes the sensors an Arduino establishes if it was a forward or backward stroke based on which sensor was tripped first. From there a keystroke is issued to Google Street View to move the virtual location accordingly. One thing we didn’t expect until we saw the video (embedded after the break) is that traversing street view is not a smooth experience. It’s more of a slide show as you exercise. Not a big deal since the hardware setup can be reused with different virtual stimuli. One thing that comes to mind is attaching a camera to the handlebars of your bike and recording your favorite rides during the warm months so that you can replay them during your indoor winter training. Of course that’s going to require some coding to marry the Arduino data to the speed of the video playback but we want to see it done anyway. Wow, image a database that would allow folks to share point-of-view videos of their rides… it’s the only way we’d ever get to see what it’s like to climb your way up Alpe_d’Huez. We saw a slew of these stationary bike hacks a while back. If this wets your appetite, check in on one with a wearable display, another that also uses Street View, or pedaling to the top of a miniature mountain. [Aki] wanted to do some stationary cycling to get in shape. Unfortunately, his stationary cycle is located in his garage which doesn’t supply much inspiration or amusement. His solution was to build a VR rig so that he could ride around inside google street view. He has rigged a simple sensor to his wheel to determine his speed and he’s using a vuzix VR 920 as a display and orientation sensor. While he notes that it isn’t perfect, or even reliable, we think it is pretty cool. He can go sight-seeing, while getting in shape from his own garage. We have to wonder if he gets a headache after a while though.